Burgundiae Comitatus Recentiss Descriptio Dno Ferdinando Lannoyo auctore. A stunning example of Abraham Ortelius' 1592 map of Burgundy, France. This map covers those areas which are today most commonly associated with the production of Burgundy Wine - arguably the finest French wine. The Burgundy wine regions included on this map include four of the five primary divisions: Chablis, Cote de Nuits, Cote de Beaune, and Cote Chalonnaise. Maconnais, the fifth, is just a little further to the south along the Saone River. It also includes the cities of Avalon, Auttun, Chalons, Beaulne, Verdun, and Chastillon, among many others. Ortelius printed approximately 525 maps for the 1892 Latin edition of his atlas, however, over the course of this map's entire run, approximately 5300 were printed for various editions of the Theatrum. 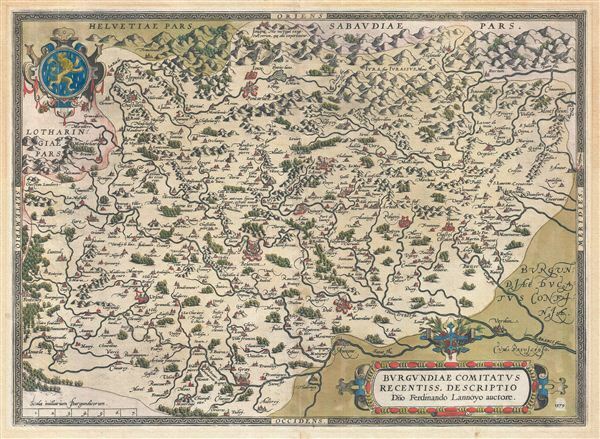 The map was printed in only one state, all examples of which are dated 1579. It is impossible to know how many have survived the subsequent centuries. Ortelius, A., Theatrum Orbis Terrarum, (Amsterdam) 1592. Very good. Minor burn mark from early framing. Some discoloration in lower outer margin. Framers tape on verso restricted to outer margins. Van den Broecke, Ort 51, 1592L29. (Koeman/Meurer: 78, Karrow: 1/113, van der Krogt AN: 4880:31A).